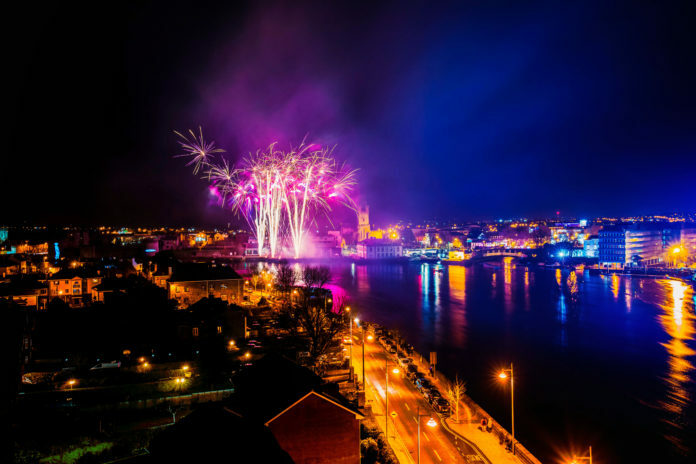 A spectacular fireworks display will start this year’s Limerick’s St Patrick’s Festival with a bang, it has been announced today. The display will take place on Saturday, March 16, 2019 at 9pm and will launch a weekend of festivities including the Limerick St Patrick’s Day Parade and the 49th International Band Championship. A 40 metre Panoramic Wheel will also make a welcome return to Arthur’s Quay Park in Limerick city for the Festival, offering unrivalled views of Limerick city and county. Community and voluntary groups, sporting and other clubs, as well as companies across Limerick, are being invited to enter the 2019 Limerick’s St Patrick’s Day Parade, which will be the highlight of a three-day festival extravaganza this March. Applications are now open from groups wishing to take part in what has become the largest St Patrick’s Day Parade in Ireland outside of Dublin. The theme chosen for this year’s festival is ‘One Giant Leap’, in honour of the 50th anniversary of the moon landing and huge steps that Limerick has undertaken in transforming itself over the last number of years. Thousands of people are expected to line the streets of Limerick City from midday on 17 March for one of Ireland’s largest regional St. Patrick’s Day Parades. The parade, which is being co-ordinated by Grooveyard Productions on behalf of Limerick City and County Council, will feature thousands of participants from various community groups, companies, bands and sports clubs from across Limerick and further afield. If you would like to participate in this year’s parade, the first step is to complete the form which can be downloaded fromwww.Limerick.ie/StPatricksFestival. Full details of the 2019 Limerick St Patrick’s Festival will be announced in the coming weeks and you can follow all the action onLimerick.ie/StPatricksFestival.